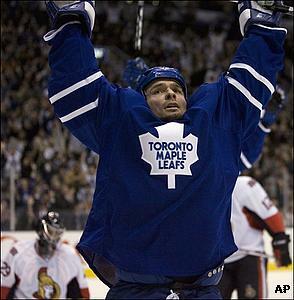 Maple Leafs right winger Darcy Tucker celebrates after scoring on Ottawa's Martin Gerber ( 700K). It had been almost a full calendar year since the Ottawa Senators were shut out, but the Toronto Maple Leafs found a way to do just that. In the process, they ended a five-game slide. Vesa Toskala made 24 saves and Mats Sundin tied Frank Mahovlich for 27th on the all-time list with his 533rd career goal as the Leafs shut out the Senators 3-0 at the Air Canada Centre on Saturday night ( 700K ). It marked the first time Ottawa was blanked since Dec. 14, 2006. Toskala, meanwhile, recorded his first shutout since March 16, when he was still a member of the San Jose Sharks. Darcy Tucker broke a scoreless tie with 45 seconds remaining in the second period ( 700K ), when the Leafs’ agitator scored on a power play. After Ottawa goaltender Martin Gerber — who lost for only the second time this season in 14 decisions — stopped a blast from the point by Bryan McCabe, Tucker controlled the rebound and slammed it into an open net for his second goal of the season. ''I think that was the best this team has played all year,'' said McCabe. ''We knew we had to bring our best against the hottest team in hockey. Toskala’s biggest save of the night came early in the second period. Moments after Toronto’s Alex Steen shot one of the goalpost, the Senators came down on a 3-on-1, but the Leafs’ netminder stood tall to keep Ottawa off the scoreboard ( 700K ). Sundin gave Toronto a 2-0 lead with another power-play goal at 6:03 of the third period ( 700K ). With Redden off for interference, Sundin got his 10th goal of the season on a slap shot from the circle that snuck between Gerber’s right leg and the post. Jiri Tlusty rounded out the scoring with his first tally since Oct. 25, when he scored twice in his NHL debut. With 4:05 left in regulation, Tlusty picked up a loose rebound and skated around the net before stuffing it past Gerber ( 700K ). The Rangers went out this summer and bolstered their offense with the signings of Scott Gomez and Chris Drury. Against Pittsburgh, their defensemen provided all the offense they needed. After getting a pair of goals from Michal Rozsival and another from Daniel Girardi, stay-at-home blueliner Jason Strudwick catapulted the Blueshirts into first place in the Atlantic Division by one-timing Paul Mara’s feed past Marc-Andre Fleury 1:40 into overtime ( 700K ) at Mellon Arena. Strudwick, who entered the game with no points in his last 13 contests, got behind Pittsburgh defenseman Sergei Gonchar and finished off a 2-on-1 with Mara, giving the Rangers their fifth straight win and nine in 10 games. New York erased an early 2-0 deficit with three goals in the second period. Rozsival scored twice in less than three minutes ( 700K , 700K ) to tie the game, while Girardi — who was promoted to the top unit after the Rangers went 0-for-5 on the man advantage in Thursday’s 4-3 shootout win at Philadelphia — got a power-play goal with 1:25 remaining ( 700K ) to give the Rangers their first lead of the night. Pittsburgh was held to one shot on goal in the third period before Petr Sykora erased the one-goal deficit with just over five minutes to play ( 700K ). Evgeni Malkin set up the play with a cross-ice feed for his 20th assist of the season, extending his points streak to 13 games. Sidney Crosby had a goal ( 700K ) and an assist in the first period, giving the Penguins’ captain at least a point in 19 straight games — tops in the NHL. On this night, though, it was New York’s defensemen who shined. Crosby was disappointed to see his team waste a two-goal lead against the red-hot Rangers, who received another solid performance from goaltender Henrik Lundqvist (20 saves). Ilya Bryzgalov wanted to be a No.1 goaltender. While he didn’t receive that opportunity with the Anaheim Ducks, Phoenix was more than willing to give him his shot. Judging by what he accomplished in his first start as a Coyote, it appears as if he’s ready to show he has what it takes to be a starter. Phoenix Coyotes goalie Ilya Bryzgalov blocks a shot by Los Angeles Kings' John Zeiler during the first period. After being picked up off waivers by Phoenix on Friday, Bryzgalov made 28 saves in his debut and blanked Los Angeles at the Staples Center for his third career shutout. It indeed was an exciting moment for Bryzgalov, who had met his new teammates only hours earlier. ''When I walked into the locker room, my new teammates were so excited to see me and made me feel like I had always been here,'' said Bryzgalov, who was Jean-Sebastien Giguere's backup in Anaheim. Coyotes coach Wayne Gretzky was impressed by the way Bryzgalov performed, considering he only called the netminder about four hours before the opening faceoff to let him know he would be starting. ''He gets a call, I guess probably two minutes after nine today, saying that we got him — and another call five minutes later from me, saying 'You're going to play at 1 o'clock,'” Gretzky said. “So I knew it was probably going to be a hard day for him and emotional day because 24 hours before he didn't know what team he was going to end up with. Phoenix captain Shane Doan scored the game’s lone goal at 11:24 of the second period ( 700K ). With his team on a two-man advantage, Doan fired a shot through a screen that found its way past Kings goaltender Jason LaBarbera, ending a scoring drought of 202:24 for the Coyotes. It was the only blemish for LaBarbera, who finished with 37 saves. Doan deflected all of the credit to Bryzgalov, who handed Los Angeles its first shutout on home ice since April 6, 2006, when Vesa Toskala — then of the San Jose Sharks — made 14 saves in a 5-0 blowout. Tim Thomas will probably see the Montreal Canadiens in his sleep, considering the Boston goaltender made 45 saves and still allowed seven goals. In what was at first a seesaw affair, the Habs pulled away with three tallies in the third period en route to a wild win at the Bell Centre. Roman Hamrlik celebrates his goal with teammates Tomas Plekanec and Alex Kovalev during third period. Guillaume Latendresse gave the Canadiens their fourth lead of the night when he scored late in the second period ( 700K ) to make it 4-3. Montreal used that momentum to barrage Thomas with 25 shots in the final period, as the Canadiens got goals from Roman Hamrlik, Mike Komisarek ( 700K ) and Alexei Kovalev ( 700K ) to skate away with the two points. Glen Murray scored twice ( 700K, 700K ), while Zdeno Chara ( 700K ) and Marco Sturm ( 700K ) also scored for the Bruins, who dropped to 9-7-2. Afterwards, Murray rightfully felt awful for the way his team failed to do more for its goalie in the third period. Carey Price made 32 saves for the Canadiens, who have won four of their last six games and improved to 11-5-3. He stopped seven of eight shots in the third period as most of the action was on the other end of the ice. It certainly had offense. Hamrlik, who gave Montreal a 5-3 lead at 4:23 of the third period ( 700K ), said the game plan was the same after the second period, when his team was clinging to a one-goal lead. Not only is this Chicago squad young and talented — it’s gritty, too. Trailing 3-2 entering the third period, Patrick Sharp scored three times in the last 20 minutes, giving the Blackhawks their fourth straight win over Detroit and their second in as many games at Joe Louis Arena, where they’re the only visiting team to win this season. Chicago Blackhawks' Patrick Sharp slips a shot past Detroit Red Wings' Dominik Hasek for a goal during the third period. Rene Bourque scored a pair of shorthanded goals ( 700K ) for Chicago (11-8-1), which tied a team record with three on the night. Nikolai Khabibulin made 39 saves for the Blackhawks, who took advantage of a struggling Dominik Hasek by beating the Detroit netminder four times on just 16 shots. Hasek has allowed eight goals on the last 23 shots he’s faced. Sharp put Chicago ahead with a shorthanded goal with 6:52 to play in regulation ( 700K ). The speedy forward went in alone on a breakaway after Red Wings defenseman Nicklas Lidstrom lost his balance at the Blackhawks’ blue line. Sharp also scored 4:30 into the third period ( 700K ), and added an empty-net tally with 30 seconds left for the hat trick ( 700K ). Sharp now has 10 goals — four of them shorthanded. Bourque became the eighth player in franchise history to score two shorthanded goals in the game. His second of the night, which came 7:11 into the second period ( 700K ), gave Chicago a 2-1 lead. Henrik Zetterberg ( 700K ) and Tomas Holmstrom ( 700K ) had a goal and an assist for Detroit. Brian Rafalski also scored ( 700K ) for the Red Wings, who lost in regulation for only the fifth time this season. A video replay in the third period awarded Rod Brind’Amour his second goal of the night, helping Carolina avoid the possibility of losing its third straight. Carolina Hurricanes' Rod Brind'Amour skates to the bench after his goal against the Florida Panthers during the first period. the third, when it was handed an 83-second two-man advantage after both Brind’Amour and Glen Wesley were sent to the box. But the Panthers failed to get the equalizer as the Hurricanes picked up their 12th win of the season. Brind’Amour gave the Hurricanes a 1-0 lead midway through the first period on a give-and-go with Cory Stillman. 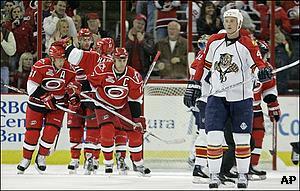 With Carolina on a power play, Brind’Amour was able to finish off the play as he fired a shot past Panthers goalie Tomas Vokoun, who finished with 31 saves. Brind’Amour put his team up by a pair 2:44 into the third period, when he took a pass from Mike Commodore and slipped the puck past Vokoun. The goal was originally waved off, but replays concluded that Brind’Amour had in fact scored. Nathan Horton ruined Cam Ward’s shutout bid with 6:01 remaining in regulation. The Panthers’ forward was able to redirect a shot from Olli Jokinen past Ward, who was caught at the left side of the net. Ward made 27 saves in the victory. ''It was a freak bounce, my fault there,'' Ward said. Nashville got the better of the chances and arguably outworked St. Louis. But Hannu Toivonen simply wouldn’t let his team lose. 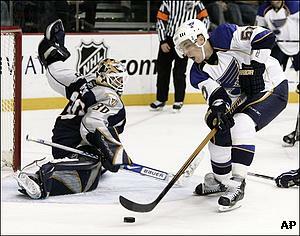 St. Louis Blues left wing David Perron scores on a backhand shot against Nashville Predators goalie Chris Mason. The Blues’ netminder made 35 saves through three periods and overtime before stopping all three attempts in the shootout as St. Louis — the last team to reach avoid this season — skated away with the two points at the Sommet Center. Brad Boyes scored the lone goal in the breakaway session, while Nashville’s J.P. Dumont, Martin Erat and Alexander Radulov all came up empty against Toivonen. Radulov ( 700K ) and Jordin Tootoo ( 700K ) scored for the Predators, who entered Saturday’s action with a 6-0-1 record in their last seven games and 8-1-1 in their last 10. Afterwards, Nashville coach Barry Trotz wasn’t exactly steaming. In the end, Toivonen was the difference. Boyes also scored in regulation for the Blues ( 700K ), as did rookie David Perron ( 700K ), as St. Louis improved to 2-0 against the Predators this season. The teams will meet again on Monday night. Calgary is doing its best to alleviate the pain of what has otherwise been a horrid month. Owen Nolan and Matthew Lombardi each tallied a goal and an assist as the Flames won their second straight after dropping the first five games of November. 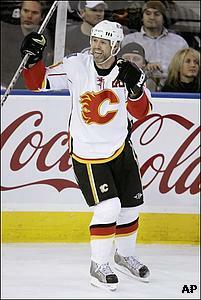 Calgary Flames' Owen Nolan celebrates his assist on a goal by teammate Matthew Lombardi. After being frustrated early by the play of Edmonton goalie Mathieu Garon, Lombardi broke a scoreless tie when he finished off a 2-on-1 with Nolan to give the Flames a 1-0 lead (). The tally broke Garon’s shutout streak at 106:42. Calgary quickly took a two-goal lead, as Nolan collected a loose puck near the Oilers’ net and roofed a backhander over Garon to make it 2-0. It was Nolan’s second goal of the season. The Flames went up by three midway through the third period when Craig Conroy collected Alex Tanguay’s feed from behind the net and fired a shot through Garon’s legs to make it 3-0. It was just the third goal of the season for Conroy, who was threatened by coach Mike Keenan with losing his job on the top line with Tanguay and Jarome Iginla. Edmonton ended Miikka Kiprusoff’s shutout bid when Andrew Cogliano picked up a rebound at the side of the Flames’ net and put one off the Calgary netminder’s skate and over the line to make it 3-1 with 7:27 left. Edmonton was held to just 16 shots on goal. Looks like the NHL needs to start worrying about the champs again. Jean-Sebastien Giguere made 31 saves and Corey Perry scored the only goal in the shootout to give Anaheim its fourth straight win with a victory over San Jose. Anaheim Ducks' Corey Perry skates toward his bench after scoring a shootout goal on San Jose Sharks' Evgeni Nabokov. "I thought I got it actually," Sharks goalie Evgeni Nabokov said of Perry’s shot. "He did a great move and he put the puck upstairs. I went for a desperation save after that." The Sharks entered the night winners of four consecutive games, but Devin Setoguchi, Patrick Marleau and Joe Pavelski came up empty against Giguere in the breakaway session. Anaheim’s win streak began against San Jose with a shootout victory on Nov. 9. The Ducks, now 10-8-3, took a 1-0 lead on a goal by Chris Kunitz at 15:24 of the first period and maintained that edge until 7:03 the third, when Torrey Mitchell finally solved Giguere with his fourth goal of the season. It took a deflection to do so, as Mitchell was able to redirect a blast from the point by defenseman Sandis Ozolinsh. "I don't know if you can say we're finding our groove, we've won four in a row but three of them are in shootouts," said Ducks coach Randy Carlyle. "We're not going to get too high on what we've accomplished. We've sure had our fair share of struggles early in the season and for whatever the reason but we're starting to get a understanding of how we have to play and our hockey club has to play a strong forechecking game and be physical in order for us to be effective." Evgeni Nabokov made 28 saves for the Sharks. San Jose is idle until next Saturday night, when the Los Angeles Kings visit the HP Pavilion.